Facilities: None – a takeaway cabin was on-site in The Glen car park when we visited. Go prepared with appropriate footwear, clothing, snacks and water. Sligo is a hidden treasure (in my view). It is very much off the tourist trail which makes it a quiet place to visit but there is so much on offer. Climbing Knocknarea is most definitely a highlight. Please read full details below and click on this link for more details about Knocknarea and Strandhill. This walk is not accessible at all and should only be explored with children who are comfortable with climbing and walking for an hour plus. This can be extended to a minimum of 2 hours if you ascend one side, descend the other and then walk around the base trail. For those of you with lower mobility levels the base trail is a wonderful option to enjoy the splendid views. While this (base) trail is accessible the access to it is not, also it’s a linear walk. On our visit it was not very well signposted but it seemed newly open so no doubt these will be added at some point. 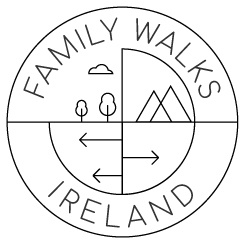 Find more wheel and family-friendly walks in Sligo click here.